I have spent hours drooling over this book! When it arrived in the post I was wondering what was in the package because the book was a lot bigger and thicker than I had anticipated. When it comes to cookery books this one is quite something. Most of today's cookery books seem to be just recipe books and assume you know everything about cooking . . . which of course most of us don't, otherwise why would we be buying them. Back in the 1950s and early 60s every housewife would have started married life with a cookery book showing her all that was needed to cook traditional meals and showing the different techniques in the kitchen, books like the Radiation Cookery Book or the Main Cookery Book (published for use with gas cookers). Fairly basic books but full of useful information. 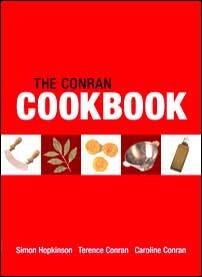 The Conran Cookbook has taken this idea and expanded it. The inside cover describes the book as "Taking you from the market place to the plate . . . encompassing everything the home cook needs to know from the essential knowledge necessary to choose and prepare over 1,000 ingredients to equipping the kitchen, planning successful menus and cooking over 450 delicious and nourishing dishes". If you have a question about something to do with food and its cooking you will more than likely find it here. If you have only one cookery book in your kitchen this should be the one. As you would expect from any book carrying the Conran name, it is beautifully designed and illustrated, as well as been clearly written and easy to follow. You wanted to know about fish? All the main varieties of fish and shellfish are illustrated and there are guides to preparing all the different types, with each guide having step by step photographs showing how it is done. This is the theme throughout the book covering every area of food and its preparation. It is a mine of information. Not only is it for those new to the art of cooking but also for those who have been cooking for years and are afraid to ask about something for fear of embarrassment. This would make a great Christmas present or be ideal for newlyweds . . . or better still why not enrich your cooking skills by getting a copy for yourself. It will be a shame to get food stains on it but that is where it is going to be kept, close at hand in the kitchen. Did I forget to mention that there are some great recipes as well?